May 26, 2014 will go down in the history of India as a day of renaissance. On this day, Narendra Modi was sworn in as the 15th Prime Minister of India. This is the beginning of a glorious period, specially after a decade of drought of good governance under the scorching heat of corruption. 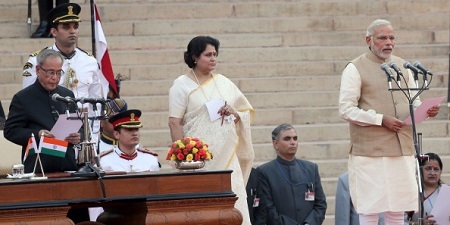 Across the width and length of India there was a welcome shower of good will and people with the new PM were a determined lot to lift the nation from the morass of poverty, illiteracy, inflation, high price and above all unaccountability in order to usher a new era of justice, virtues, good and honest governance leading to happiness and harmony. Invitation of Modi government to the Heads of SAARC countries to participate in the swearing-in ceremony was like icing the cake of goodwill and friendly neighborhood. The heads of the SAARC countries rose to the occasion and the planes carrying PM Nawaz Sharif of Pakistan, President Mahinda Rajapaksha of Sri Lanka, President Hamid Karzai of Afghanistan, President Abdulla Yameen of Maldives, PM Sushil Koirala of Nepal, PM Tshering Tobgay of Bhutan, Bangladesh Speaker Shirin Sharmon Chaudhury and PM Navin Chandra Ramgoolam of Mauritius touched Indian soil for the great day. The transition of power has been so peaceful that many nations observed this in awe. So impressed was UK that BBC had arranged a live coverage of the swearing-in ceremony. Pakistan too telecast the proceedings live. In all probability unrelated though, The Air Force 1 with the most power President Barack Obama had landed in Afghanistan not very far from the Indian Territory. Besides voting to power, people of India in general, the bureaucracy and judiciary in particular have the sacred duty to perform. They need to be honest in their day to day life and take positive steps to push the nation a few yards in its quest for progress and prosperity. We, the people, wish Modi and his team good luck. Since last 24 hours, I have been thinking - "has Indian spring arrived ?" And then this article helped me. It started with Arab spring in late 2010, spread over continents, India witnessed a happening 2011 - Swami Ramdev and Anna hazare lead movements involved masses throughout the nation and then we thought it was all stopped ! Meanwhile, govt changed in Egypt and other nations in the Arab region.Those springs witnessed losses of lives. Egypt is still finding right govt at the moment. But, in India, it happened so quickly, so effectively, almost without loss of lives - as this article reads "The transition of power has been so peaceful that many nations observed this in awe"
I guess, Indian spring has arrived, it will be proven in next 1 year or so.